Though Ryerson is a diverse school sitting in the heart of Canada’s largest metropolis, and its students and faculty are always striving toward change and pushing for a more inclusive community, some things fall between the cracks. Period poverty is a hidden type of poverty – no one is going to notice if someone doesn’t have enough money for tampons this month. That’s mainly because of the taboo menstruation is rooted in. The female body has been menstruating since forever, so why is it shameful to talk about, let alone in a situation where someone is struggling to access the necessary products? Pseudonyms and taboos for the words “period” and “menstruation” date back to the writing of the Qur’an and Bible, both referring to a woman as “impure” or “unclean” during her time of the month. Today, students all over the world miss days of school due to the lack of care products for their periods. In developing nations, this is a greater and more systemic issue. But shockingly, one-third of Canadians who get a period have struggled to afford menstrual hygiene products, according to a survey by Plan International Canada. Asking for help shouldn’t be shameful or embarrassing, but it is; for cisgender women and, even more, people who identify as trans and non-binary. Hygienic menstrual care is a right for humans, yet everyday life is hindered for many as they struggle getting access to the products they need. Yanique Brandford is a third-year medical physics student at Ryerson and is also the founder of a non-profit charity called Help a Girl Out. This charity works to provide menstrual-hygiene products for anyone in need. Spreading awareness and smashing the period taboo is not a common thing in the Ryerson community. 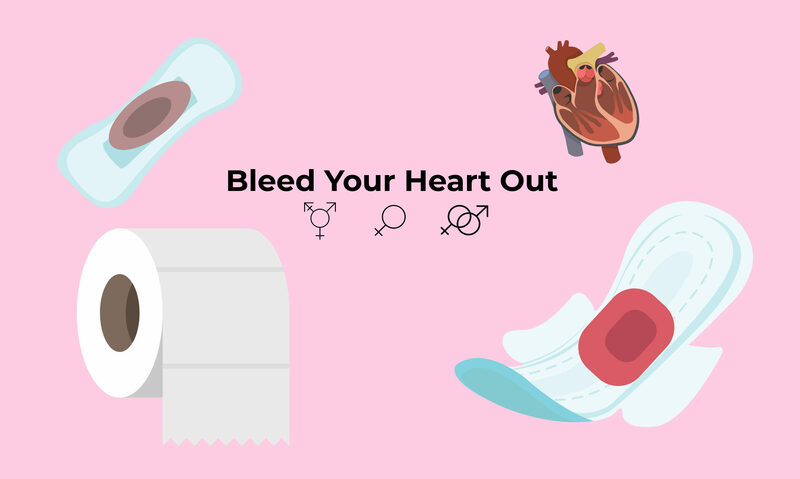 Though there have been amazing period-related initiatives, such as alumna Alyssa Bertrum creating an organic period-product subscription program, or our Rams athletes sharing how they deal with their periods, there needs to be a safe discussion for people struggling to financially handle their menstrual cycles. Ryerson has a Centre for Women and Trans people, which provides pads and tampons outside its office. However, this small yet progressive initiative isn’t widely known on campus. If the school would recognize that periods should be simple for students, there would be many more initiatives like that. This summer, Centennial College began providing hygienic product dispensers in every bathroom, regardless of gender and free of charge. This initiative helps in addressing the economic issues associated with menstrual care and promotes inclusive environments. Considering the amount of money students pay in tuition, a small initiative like this is low in cost and is something all schools should consider. Menstrual products are not a luxury. That was recognized by the Canadian government in 2015 when it removed taxes on the products. The Ryerson community should keep pushing past that and greater improve accessibility. More conversations on rights and inclusivity need to flourish, because this won’t come with a one-size-fits-all solution.